The left-front wheel of NASA's Curiosity Mars rover shows dents and holes in this image taken during the 469th Martian day, or sol, of the rover's work on Mars (Nov. 30, 2013). Engineers are gearing up to perform a check of the Mars rover Curiosity's six wheels, which have accumulated a lot of wear and tear during the robot's 16 months on the Red Planet. In the near future, the mission team plans to drive NASA's 1-ton Curiosity rover to a smooth patch of ground and photograph its six aluminum wheels using the robot's arm-mounted Mars Hand Lens Imager camera (MAHLI), oficials said. 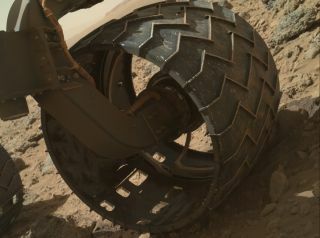 "We want to take a full inventory of the condition of the wheels," Curiosity project manager Jim Erickson, of NASA's Jet Propulsion Laboratory in Pasadena, Calif., said in a statement today (Dec. 20). "Dents and holes were anticipated, but the amount of wear appears to have accelerated in the past month or so," Erickson added. "It appears to be correlated with driving over rougher terrain. The wheels can sustain significant damage without impairing the rover's ability to drive. However, we would like to understand the impact that this terrain type has on the wheels, to help with planning future drives." Routes to future destinations may prioritize reducing the time Curiosity spends trundling over sharp rocks and other rough terrain, mission officials added. Engineers also just finished upgrading the rover's software, marking the third such installation peformed since Curiosity touched down inside Mars' huge Gale Crater in August 2012. Among other features, this latest version improves Curiosity's ability to use its robotic arm while on slopes, mission team members said. This skill should come in handy when the rover reaches the base of Mount Sharp, which rises 3.4 miles (5.5 kilometers) into the Martian sky from Gale Crater's center. Mount Sharp has long been Curiosity's main destination. Mission scientists want the rover to climb up through the mountain's foothills, reading the history of Mars' changing environmental conditions as it goes. The chief goal of Curiosity's $2.5 billion mission is to determine if Mars has ever been capable of supporting microbial life. Mission scientists have already answered that question in the affirmative, finding that a spot near Curiosity's landing site called Yellowknife Bay was indeed habitable billions of years ago. Curiosity departed Yellowknife Bay for Mount Sharp in July. It should reach the mountain's base around the middle of next year, officials have said.